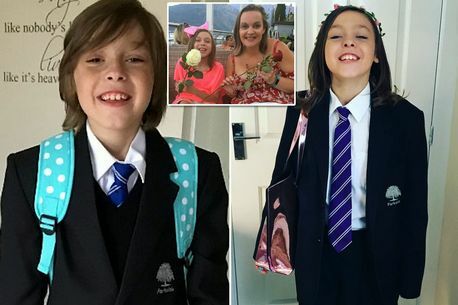 A pupil born a boy has started the new school term in skirts after making the decision to be a girl, and her fellow classmates have been 'absolutely fine' with it. Caren Middleton, from Derbyshire, said son Kian has always wanted to be a girl, and expressed an interest in a young age in 'girly' pursuits. The 44-year-old always expected her son would become her daughter one day, but was surprised it came about so soon. The 12-year-old asked to be called Zoey and chose to be a her, and Mrs Middleton said she couldn't be more proud of her youngest, no matter her gender. She told The Derby Telegraph how Zoey has been referred to the child and adolescent mental health services (CAHMS) to officially start the transition process before she hits puberty. The mum-of-two, whose other daughter is in her twenties, said: "I am so proud of Zoey. She knows exactly what she wants in the world and has sought out to get it, even at the age of 12. "She wants to be a girl. She doesn't like having boy bits and has said that she wants to start taking hormones. When they knew how their child felt, they approached Parkside Community School, where Zoey is a pupil, and they were happy to trial her coming to school in a skirt. She said: "They were all too supportive and we trialled it for two weeks after the school had an assembly to discuss what was happening with Zoey. David, 47, an engineer, struggled with the idea of losing his only son, but has come around to the idea.